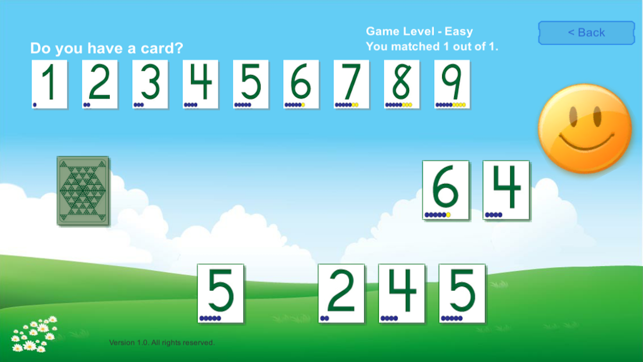 This is a favorite RightStart™ Math game, loved by children all around the world! 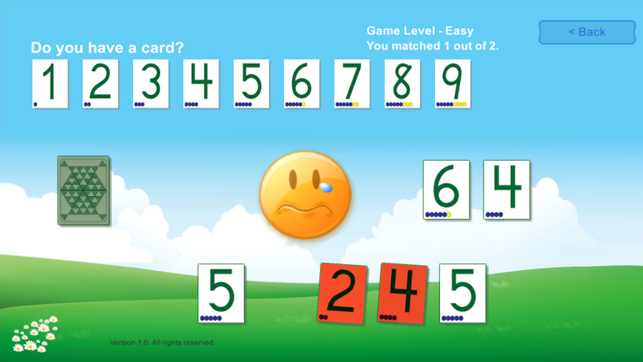 The object of the game is to match two cards that equal 10. 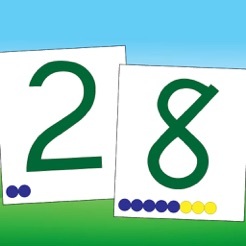 There are 29 pairs of cards using numbers 1 to 9 and three levels of difficulty. 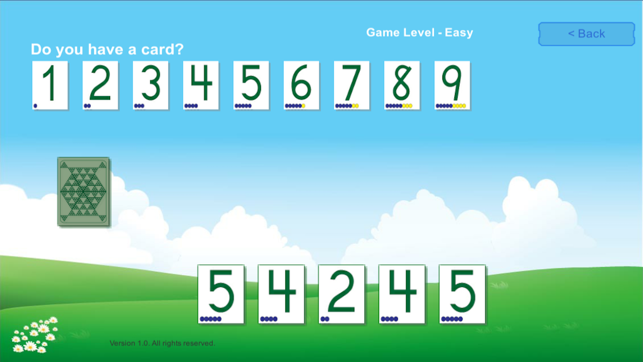 The game starts with five cards on the bottom row. 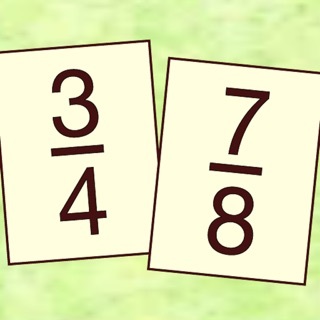 The player checks for two cards that total 10. If a pair is found, tap on the first card, then tap on the second card. If it is a successful match, the pair will go to the winning pile. If it is not a match, the cards will turn red and shake. If no pairs are found in the bottom row, ask for a card by tapping for one at the top of the screen. The card will either appear below or "Go to the Dump!" 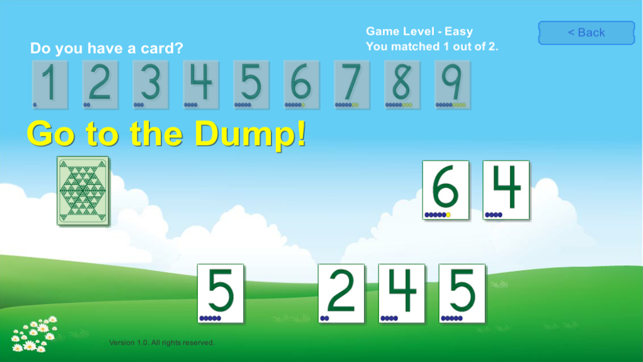 will appear and the "dump" cards will be highlighted. Tap on the card stack and a random card will appear. Check for a matched pair and select them if possible. If no pairs are available, ask for another card. If no cards remain below, and the 29 pairs have not all been found, "Take more cards!" will pop up. Tap on the card stack and five more cards will appear. Play continues until all pairs have been matched. 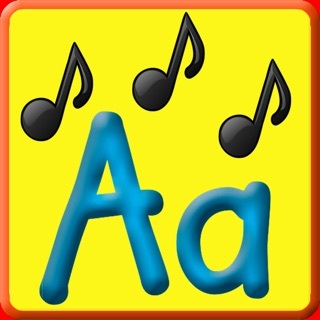 We really love this! My boys shut down using flash cards and they love this! A few suggestions: I would love to see the option to add yourself being timed so you can beat your own personal best score! Like.. how many times can you make a 10 in a minute? 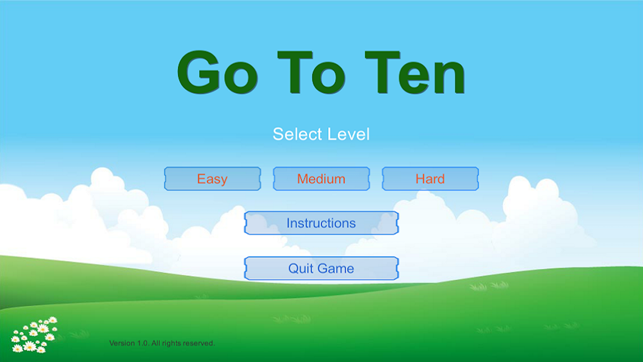 I would also love to see advanced levels add in addition & subtraction to MAKE A 10! If you have 15...what do you minus to make a 10? 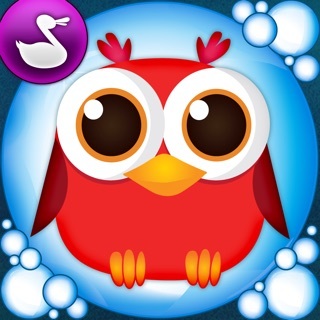 I am so glad you are finally putting these games into apps. They are so important to the program and it is hard to find time to get them all in during the school day. I hope you get a chance to make them all!